Here it is. This is the doozy that led to the extended hiatus. You know how you're not supposed to use a Ouija board by yourself? It turns out, you shouldn't do strenuous psychological, psychotronical experiments on yourself, either. 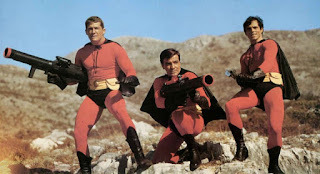 Here's where Matt tried to watch all of the Three Supermen movies (1967-86), one each day, by himself and report his findings. He got in over his head into the world of bulletproof spandex, heists, Europop, and increasingly lousy sequels. Joe K here, just checking in to say what a fun ep this was... had me laughing at work on a Monday morning, no easy feat. A fantastic solo-bolo from Matt with (spoiler) a wonderful cameo, and a great reintroduction to the podcast. Listen now & take a journey into the mouth of psychotropic madness! Thanks, buddy! Glad to be out of pajamas and institutions again. I do miss McMurphy, though. YOU elect the Ted V. Mikels film!